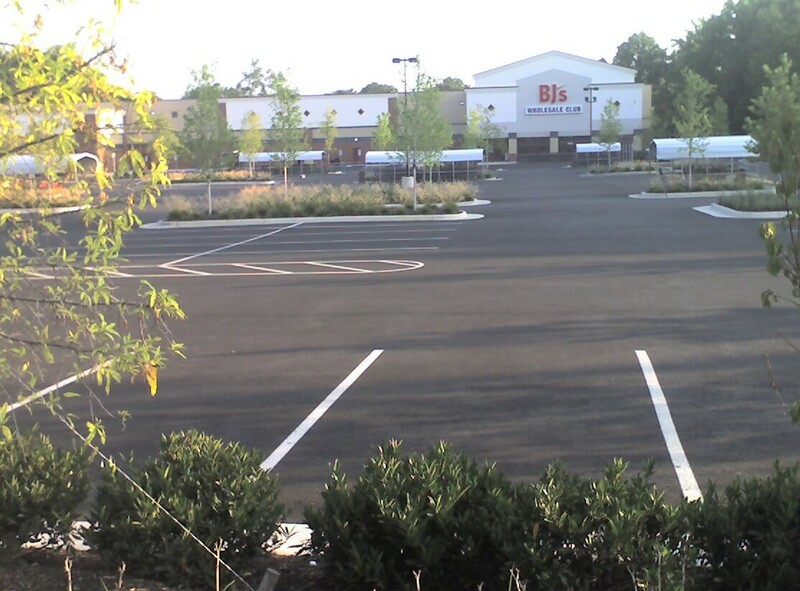 The BJ's Wholesale Club that opened in Falls Church near Seven Corners last October was a short-sighted decision by Falls Church and works against taking steps towards an improved urban/suburban environment. 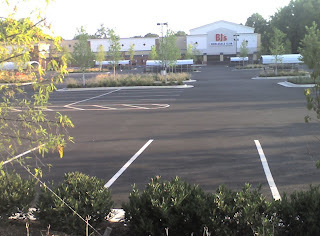 Rather than taking maximum advantage of an opportunity to improve an area that is in dire need of better design, Falls Church resorted to the same-old, same-old, big box store, with an enormous parking lot out front and little regard for the future urban design or long-term planning. 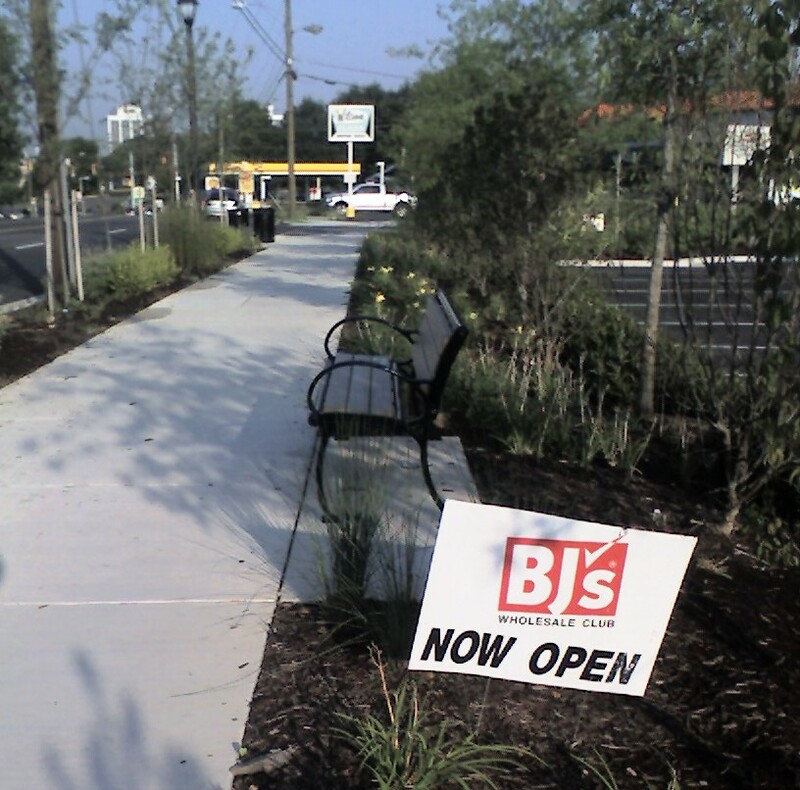 The BJs opened last October 9 to much fanfare and pretty big crowds. Most of the press leading up to and at the time of the opening was very positive: people were excited about the new store. The original deal between the property owner, JBG Properties, and the City of Falls Church was announced two years earlier in October of 2008. In that deal, the City agreed to provide $250,000 in annual tax relief to the property owners (total of about $3 million over 12 years). This deal was intended to help offset some of the costs of site preparation that included retaining walls and infill in order to make the site work for a BJs. At least one Falls Church resident perceives it as providing an unfair advantage to a business that doesn't really need that advantage against some of the small businesses already in the area. The site is approximately 8.5 acres, and the store is reportedly 87,000 square feet, about 24% of the site area. (For comparison purposes, the wildly popular, mixed-use Clarendon Common in Clarendon sits on a slightly larger 10 acres.) It is exactly 1 mile from the East Falls Church Metro. It is a typical big box retailer, with a large parking lot along the street and the store set considerably far back behind the parking. To their credit, the parking lot is nicely landscaped, including trees. Much of the site was formerly forested and as many as 100 mature trees were sacrificed for the store. The lot was full the first weekend it opened. On the numerous occasions I have passed by there since, I have never seen it more than about 2/3rds full and often more than half empty. 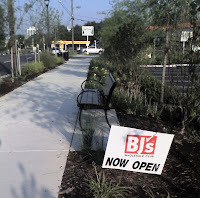 As the above resident points out, there is not the tiniest chance that Falls Church would have allowed this BJs anywhere near the center of Falls Church. It is in the absolute far southeast corner of the city (map), bordering both Fairfax and Arlington Counties, and away from the "village" part of Falls Church. One could argue that the BJs fits into this area around 7-Corners--which is not like the center of Falls Church, with its mom and pop stores--and tends to be very car-centric. However, it could have been at least somewhat better with some minor adjustments and considerably better with bigger changes. If they had simply moved the store next to the street with a wide, inviting sidewalk and put the parking behind, that would have been a nice first step to transforming this area into a more inviting pedestrian area. Better yet would have been to include a couple of small storefronts along the street, too, integrated into the streetfront. The BJs could still have been just as large, but the entry for those who drive would be in the rear. Pedestrians, instead of walking past an enormous parking lot, would walk past storefronts. Yes, it would have been the first property in the area to not put parking in front, but someone's got to move first if change is going to occur. Presumably Falls Church, with its more progressive population and policies, would be a strong candidate to try something innovative. Falls Church has been, in fact, working with Arlington County on a more progressive, long-term plan for the East Falls Church Metro station area--just one mile away. Just moving things around would have been a minor, positive change. Potentially this site could have been developed completely differently. Eight acres is pretty big and could have supported some sort of mixed use. I doubt the market in this area could support something as dramatic and dense as Clarendon Common, but certainly a more 21st century outcome could have been created. In the end, the decisions about this property were driven a lot by timing. Because of the recession, Falls Church was desperate for tax revenue and decisions were being driven almost entirely by how much taxes the site could generate than by anything else. During a different time the City might have had more opportunity to negotiate or may even have been willing to generate somewhat lesser taxes for a more interesting use. I wouldn't be surprised if at the end of the 12-year tax break period, the owners try to either negotiate an extension or just move off to a more inviting jurisdiction. The building itself is single use and could not be repurposed for virtually anything else (as evidenced by the long-empty Big Lots store that sits less than 1000 feet away in the Eden Center). Even so, some design changes could have been implemented at no cost that would have served as a small step towards transforming this area. Unfortunately, that effort was not made and we're left with another cookie-cutter, big box. I believe that the Seven Corners area has more potential than many give its due. However, unless Falls Church and Fairfax County decide to work together to develop a vision, it will remain a poorly designed, unsafe, unattractive part of the Washington region.